Did you know...the greatest North American snow storm in history occurred on Feb. 13–19, 1959 when 15 feet, 8 inches of snow fell in a single snow storm at Mt. Shasta Ski Bowl in California. Snow crystals are born in the clouds when water vapor freezes on a particle of dust, a floating bit of bacteria, or another solid material. 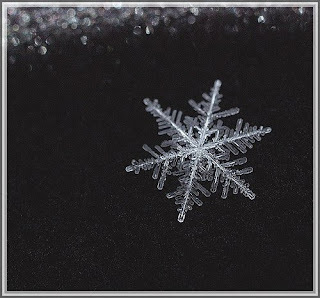 While no two snowflakes are alike, they can be generally classified into six basic patterns. Each type of flake is a result of unique atmospheric conditions. Think of them as a kind of "cloud diary" or a record of weather conditions when the crystal was formed. Star: Star crystals are born at temperatures near -15 degrees C, and are among the most common type of snowflakes. They are as delicate as they look, and superstars are rare, because large flakes tend to become broken by wind and midair collisions with other crystals. Under ideal conditions several stars my join to form a larger snowflakes. The largest snowflake on record was reported to be a whopping 8" by 12" (about the size of a sheet of typing paper). It was reported to have fallen, probably with a thud, in Bratsk, Siberia in 1971. Dendrites: Dendrites are stars with attitude. Essentially, they are three dimensional star crystals with branches growing on more than a single plane. Branches (or arms) connect randomly to a central structure. These complex critters form under extremely cold conditions (-20 to -25 degrees C) when high levels of atmospheric moisture are present. Columns: Columns are produced when the air is dryer. They are generally smaller, have a higher density than star crystals, and form over a wide range of temperatures (15 to -25 degrees C). Plate: Plates are wanna-be stars that are essentially moisture starved. They form at temperatures of -10 to -20 degrees C when there isn't enough atmospheric water vapor available to form the delicate arms of a classic star. Column capped with plates: Capped columns are composite flakes formed when the particle of snow passes through different temperature and moisture zones on its journey to the ground. The columns form first, usually at higher and dryer regions of a cloud, and combine with star flakes as they fall through lower and wetter cloud elevations. Needles: Needles are formed at the upper end of the temperature spectrum, usually when ground temperatures are at or near the freezing point. To grow, these crystals need an air temperature in the -5 to -10 degrees C range. Needles tend to produce a dense, stiff snow pack which can produce an avalanche under the right conditions.